It’s no secret that I am not a fan of staying in hotels while on vacation. 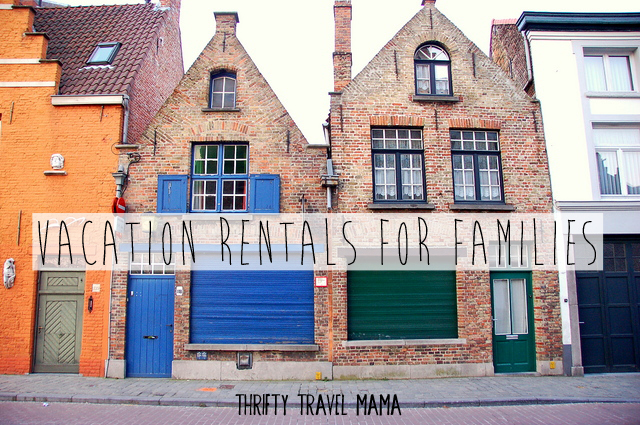 I may change my mind when the boys are older, but for now, we stick to vacation rentals. Hotel rooms do not offer our family of five enough space, and – even worse – they are often more expensive than renting an entire apartment. Want to get in on the vacation rental craze? 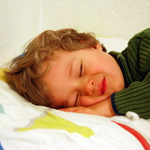 For your next vacation, consider a private property for your family instead of a hotel room. Here are three sites to get you started: Airbnb.com, Homeaway.com, and Vrbo.com. Airbnb is the new kid on the vacation rental block. Of the three sites, this one is definitely the most diverse. The current stats on the homepage boast properties in 35,597 cities and 192 countries. I’ve seen all sorts of interesting spaces for rent here; beyond simple apartments, you can also find houseboats, castles, off-grid homes, cottages, tree houses, bedouin digs, and places to go glamping. 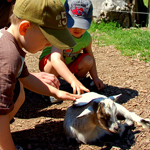 Simply enter your desired location, dates of stay, and how many guests. I usually include the older boys, but not the baby. Some hosts charge for extra guests (even children), so it’s important to be honest about how many are in your party. Perhaps the key to Airbnb’s variety is that the properties available on their site are often real people’s homes. Sure, some are managed vacation properties, but many are just some Joe Schmoe’s pad that he wants to rent out while visiting his great Aunt Edna for two weeks at Christmas. Some properties even state this outright – one woman posted that the property was her actual home, and that if you booked it, she would just move out for a few days. Airbnb also lists rooms for rent (as opposed to the entire home/apartment) for the super budget-conscious. More a community than the other two websites, Airbnb requires you to create a profile, upload a photo, and enter your phone number to contact potential hosts. As an introvert who is not big into social media, I found it rather annoying to have to give away all this information just to make property inquiries. However, it does add an element of comfort for the owner to be able text a real person, so I acquiesced. If you want the entire place to yourself, click on “Entire home/apt” in the left column. Otherwise, the search results will show private rooms and shared rooms in your desired location. Adjust price for your budget, and filter results based on neighborhood or amenities. A few tips on selecting a property… First, take a good look at the photos. If the property has three bedrooms, are all three pictured? Even more important, what is not pictured? The apartment is supposed to have a washer and dryer, but where are they? Second, ask a LOT of questions. Ask how far it is to the nearest grocery store. If there is free parking, is it right outside the house? In a garage three miles away? Third, examine the reviews. Are there any for this property? If not, why? Is it new? Were renters not satisfied? If a negative review exists, did the host respond to the complaint and post a reply? I also recommend contacting all the host for the properties where you are interested in staying. For my recent booking (we’re going to the Netherlands in a few weeks! ), I ended up reserving my fifth choice. My first choice was not available, and my second choice only responded once to questions I asked. The other two did not reply at all. Currently, the only method of payment that works for most users on Airbnb is credit card. As with hotels.com, you must pay in full for the reservation up front. What happens to your money? The funds are held by Airbnb and then released to the host 24 hours after the guest checks in. Some countries allow payments via Paypal, but I was not able to get that option to work. However, even though the property I reserved was in the Netherlands (payable in euros), I could change my country to the US and pay in dollars. The exchange rate matched the one I found on xe.com exactly. Airbnb currently allows credit card payment in USD, CAD, EUR, and GBP. If your credit card is not in one of these currencies, the rate is charged in EUR. 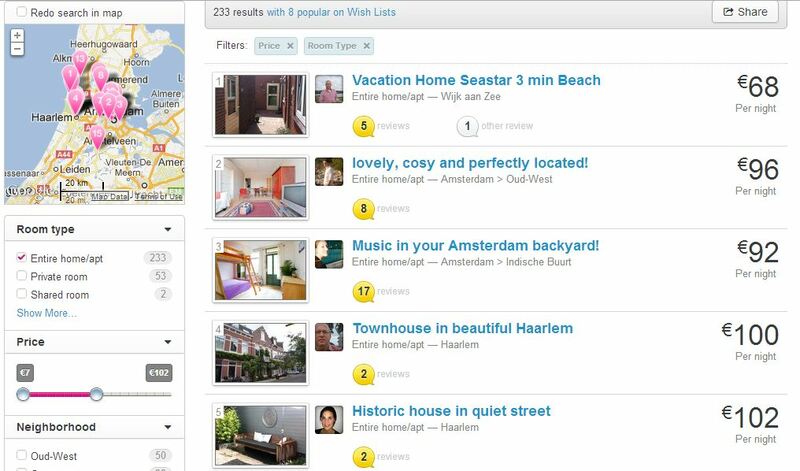 To read about my personal experience using Airbnb in The Netherlands, click here. For more help on booking with Airbnb, click here. If I can’t find what I’m looking for on Airbnb, I hop on over to Homeaway.com. Current stats for Homeaway’s offerings claim 720,000 vacation rental home listings throughout 168 countries. Homeaway’s default is the US, but click another region below the map to search Hawaii, the Caribbean, Europe, or worldwide. I find the listings on Homeaway to be a tad more expensive than Airbnb. This is probably due to the difference in structure between the two sites – Airbnb charges a service fee for completed bookings, but simply listing your place is free. 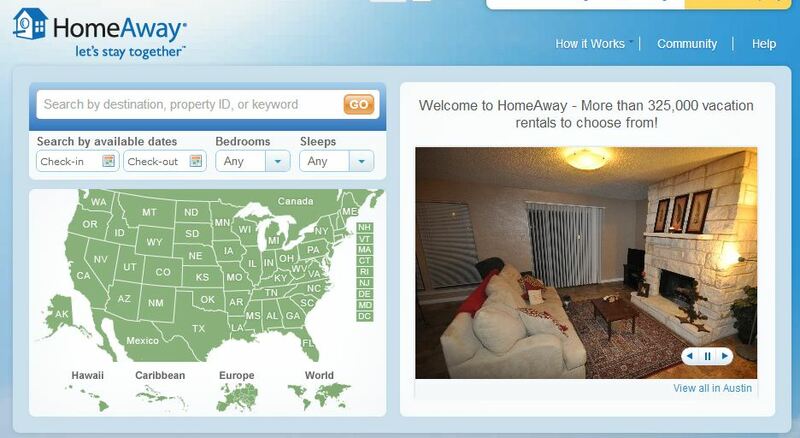 Homeaway charges owners to advertise their spaces, but they does not handle transactions or levy guest fees. Homeaway search options are more limited than Airbnb, but they are much better than Vrbo.com. Filter results by number of bedrooms, number of guests, or by amenities such as wireless internet, parking, pet-friendly, etc. If price is an issue, you should know that it’s only possible to enter a monetary range per week (not per night) and in USD. Switch to map view to search geographically. One minor annoyance for international users is that the rates listed in the search results are displayed in USD. Clicking on individual properties gives the user an approximate exchange rate, but it can be confusing to search in dollars when your budget is in euros. Also note that many Homeaway properties have minimum stay requirements, some of which are an entire week. I ran into trouble with this when trying to book our recent Netherlands stay. However, the advantage to this is that if you are staying a week (or more), rates can be less than when booking per night on other sites. If a weekly rate is not listed, ask the property manager for a quote. I was able to get a booking down from $98/night to $89/night with the right dates and a pretty please. Since Homeaway does not handle transactions, it is important to ask about any extra fees that the host might charge – cleaning, linens, parking, etc. – and payment method. Get an invoice and a rental agreement in writing before sending any payment. Make note of the cancellation policy before booking. Most are quite strict. For more help with Homeaway bookings, click here. To find out whether or not I’d personally recommend Homeaway, click here. Vrbo is my least favorite, but it’s still worth a look before giving in to over-priced hotel rooms. They are owned by Homeaway, which only make sense when you figure out that the two companies have different clientele. Vrbo has fewer listings (currently 190,000+ properties in 100 countries), but it is the older of the two sites which means it has more loyal customers and more reviewed properties. Both charge hosts fees for listing their properties and are hands-off when it comes to payment arrangements. Like Homeaway, Vrbo is best for US properties, but other locations around the world are searchable by clicking on the tabs to the left. 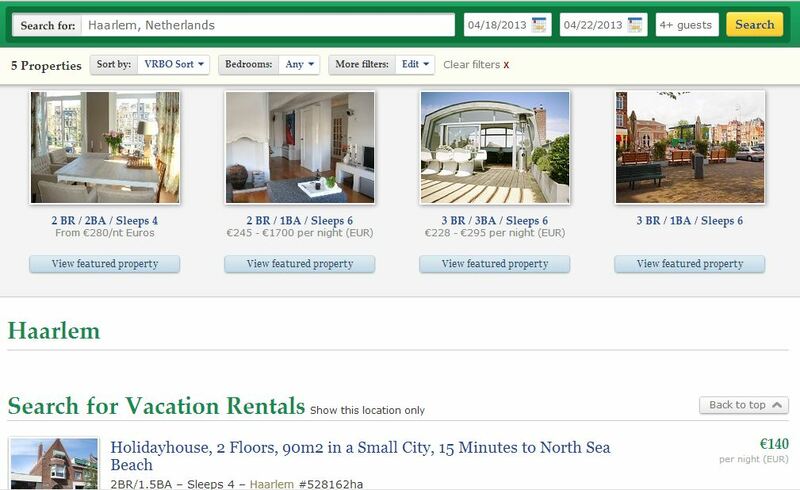 It can be hard to navigate the listings and find exactly what you are looking for, especially when searching big cities such as Amsterdam, like I did. Few filters are available to narrow down the options. But, prices are displayed per night and in local currency which is a nice plus over Homeaway. When clicking on a listing, scroll down to see details regarding amenities, pricing, and minimum stay requirements. Keep in mind that even though search results list a nightly rate, a large number of properties require guests to stay longer than that. Sort by, Bedrooms, and More filters are the only search options. Results are displayed in one column below. Comb the reviews at Vrbo for additional information regarding potential hosts and homes, but keep in mind that Vrbo gives owners the option to display all feedback, only positive feedback, or no feedback at all. This company wouldn’t still be around if it did not have many reputable rentals, but be extra cautious in asking as many questions as possible until you’re comfortable enough to make the booking. Read about Vrbo’s advantages here and FAQs for travelers here. To see how I fared with Vrbo in Salt Lake City, click here. As always, when renting from individuals, be sure to protect yourself. If a listing looks to good to be true (think a ten bedroom home in Tuscany for 50 euros per night), it probably is. Each site has their own safety tips (Airbnb, Homeaway, Vrbo), but you can find additional tips here. With a little luck and a few simple searches, you could be on your way to renting an amazing home during your next vacation for less than the cost of a hotel room but with enough space for your family. 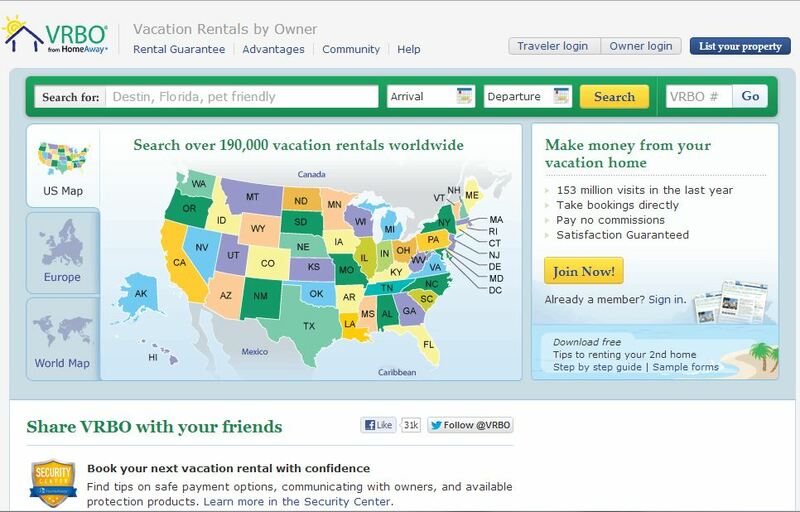 Have you used any of these sites before to book vacation rentals? We’d love to hear about your experience! 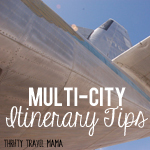 This entry was posted in Planning & Research and tagged accommodations, baby, cheap, Deals, foreign currency, how to, planning & research, tools, vacation rental by thriftytravelmama. Bookmark the permalink. Thank you for posting this! 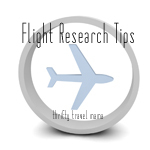 Great advice and I WILL be looking at these websites for our next vacation!! Thank you for this advice. I’m looking for cheap holiday destinations for an upcoming family trip, and part of it is searching for affordable places to stay. Your blog post just made my life easier. 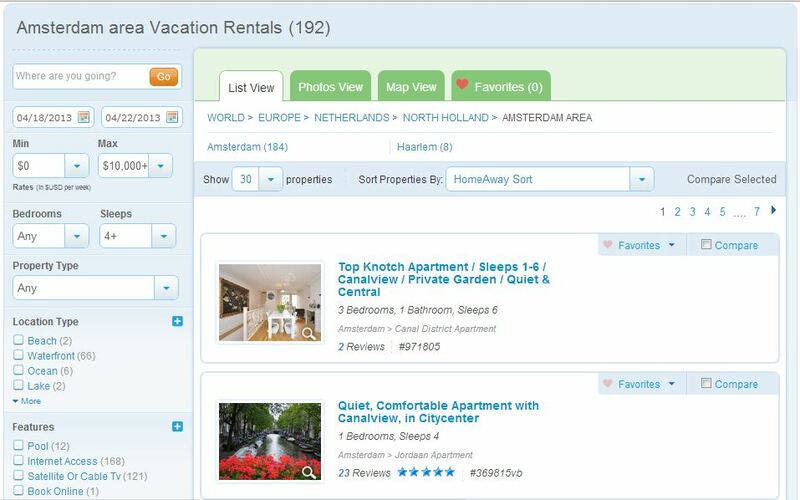 I’ve been having a bad experience with Homeaway properties in Amsterdam. I see a property with a price that seems really good (too good to be true, I guess). So I submit an inquiry. Then I get a response back from another site…called directstay….with same info/pictures but completely different prices and availability. It’s like they’re trying to lure you in to liking their property with an awesome price, when it’s really way, way more expensive? Anyway, very frustrating. Hi Rosie, I am so sorry to hear that! I had a TERRIBLE time finding a place in Amsterdam (actually, Haarlem). I couldn’t find anything to fit my usual budget. I finally ended up going with the cheapest thing I could find on airbnb which turned out to be a bad experience. Try looking for hotel deals on Travelzoo or sometimes booking.com has some vacation rentals or aparthotels that are affordable. Good luck! Oh and by the way, I’m usually quite wary of 3rd party sites like you mentioned. I feel safer booking directly with the owner or manager. 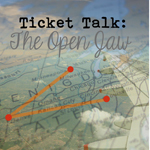 Great tips, it seems that I am not the only one struggling to find anything in Amsterdam – wish I had known how hard it was before booking my tickets – Will have a closer look at apartment rentals. All hotels that are budget are too expensive have have bad reviews! Love your blog!